This week MMMM returns with a look at a rather unusual figure – Brutal Superman. This guy forms part of Kinnikuman Part #11 which happens to be among my favorite parts of the Kinnikuman line as it houses M.U.S.C.L.E. figures #68, #134, and #139 among some other figures I look at as chunky due to their larger size (#104, #125, #133, #136). 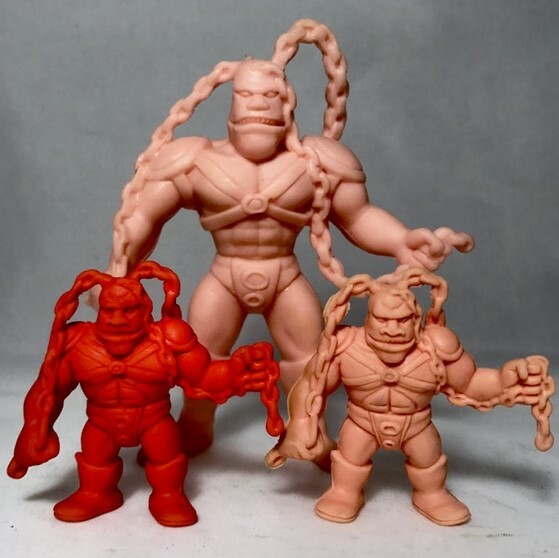 Though all of these figures were released as M.U.S.C.L.E. there is very little else that was released in the Japanese lines due to them all being henchmen of Octopus Dragon in one TV movie. 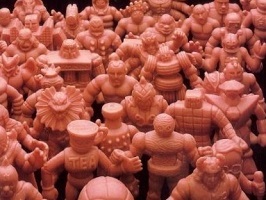 So I guess they were not popular which is a shame as I would have liked to be able to add a few different variations of all of the figures in Kinnikuman Part 11. This is where the Brutal Superman comes in. He was not released as a M.U.S.C.L.E. – one of only two figures in Kinnikuman Part 11 that wasn’t. This makes me wonder why. My first thought is that he has chains coming out of his head in which he uses as weapons and there is a part near his head that I suppose could break off and choke small children? But then I look at M.U.S.C.L.E. figures #82 and #168 which also have links that could easily break and that squashes my theory. After this I’m stumped. I really find it hard to understand why Mattel would leave out certain figures in a particular tree. Some of them are obvious like the Brockenman and Kinnikuman baby – this guy it’s not. Brutal Superman is actually a pretty cool looking figure. He has the same pose in Kinkeshi and Deka, so much so the figures are practically identical. This I find to be a shame as well due to the possibility of him swinging a chain in some way, there could be a number of different poses presented to us with this figure. I wish I had more to show here but sorry to say these are the only three figures I own of the Brutal Superman. This entry was posted on Tuesday, May 23rd, 2017 and is filed under UofM News. You can follow any responses to this entry through RSS 2.0. You can skip to the end and leave a response. Pinging is currently not allowed.